Only if you want to use the default file contained in the Debian package. If you want to use the file created in this tutorial, then filter = pureftpd is correct. This is very basic but important to you, and for your hosting account later to play with php script. ERROR: You have configured PHP not to allow short tags (short_open_tag=off). This shouldn't be a problem with SquirrelMail or any plugin coded coded according to the SquirrelMail Coding Guidelines, but if you experience problems with PHP code being displayed in some of the pages and changing setting to "on" solves the problem, please file a bug report against the failing plugin. The correct contact information is most likely to be found in the plugin documentation. 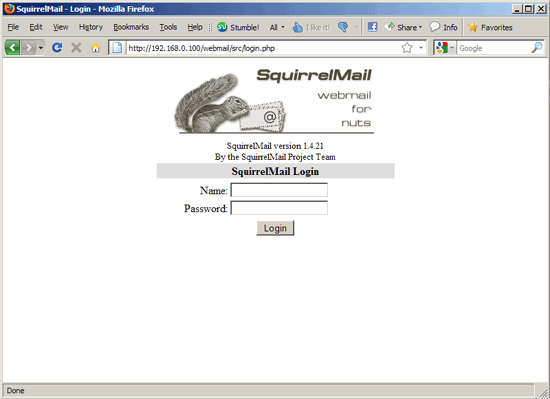 It's a basic php configuration, but might be the one of problems with people that use SquirreMail.